The Canadian boreal mixed wood forest represents one of the largest and most biodiverse environments in the world. It’s also where intensive logging and forest management activity takes place. Logging in this environment, particularly in northern Alberta, is about to become a lot more intense with a proposal by a joint-venture company called KAQUO Forestry and Resource Development to sell tree farming permits and develop the forest resources themselves on about 200,000 hectares of this type of forest in the Peace River area. The land is owned by three Métis communities. Their partnership in KAQUO is with British-based multinational, Active Energy Group Plc. The forest they are attempting to commercialize consists of about 70 per cent hardwoods such as aspen and poplar and 30 per cent softwoods such as spruce, pine and fir species in the 50 years and older range. 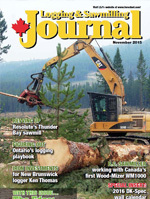 About 20 years ago, in a casual discussion in a banquet hall among government, industry and academic representatives, the group agreed to partner on a long term project not far from the Métis-owned land called the Ecosystem Management Emulating Natural Disturbance (EMEND) project to evaluate various logging practices and their impact on forest health in this environment. EMEND’s work started under the umbrella of the now-defunct Sustainable Forest Management Network (SFMN), established and funded by the federal government, Alberta government, and industry partners as one of Canada’s Network of Centres of Excellence. Natural disturbances such as fire are common, and in fact necessary, in the boreal forest to maintain its health. The EMEND project, through applying various methods and percentages of forest harvesting, aims to discover practical forest harvest and regenerative practices that best maintain biotic communities, spatial patterns of forest structure and functional ecosystem integrity compared with mixed wood landscapes that have originated through wildfire and other inherent natural disturbances. In other words, researchers are attempting to provide industry with forest management options in this environment that are both practical and help to maintain the ecological integrity of logged and regenerated sites. “EMEND is one of the few, perhaps the only real, existing legacy of the SFMN,” says Dr. John Spence, EMEND program coordinator and professor at the Renewable Resource Department at the University of Alberta. EMEND is one of the largest projects of its kind in North America, taking in 1,000 hectares within about 28 square kilometers. It is about 90 kilometres northwest of Peace River, in a Forest Management Area (FMA) managed by Daishowa-Marubeni International (DMI). Canfor owns the coniferous harvesting rights in this FMA. Spence says DMI’s pioneering of ecosystem-based forest management (EBM) in concert with scientific research like EMEND is significant. “DMI’s idea of how to manage forests in Alberta was quite revolutionary,” he says, although since the mid-1990s, other companies have followed similar paths, one example being Alberta Pacific Forest Industries (AL-PAC). In addition to the unprecedented size of the EMEND experiment, the project is forecast to run for one stand rotation, which is approximately 80 to 100 years, to provide as complete a disturbance and recovery picture as possible to industry and government decision makers. The experiment essentially retains various amounts of wood fibre during harvest in different forest types, with recovery response monitored over a full forest rotation. Four forest types were selected for study. The first has a canopy of more than 70 per cent deciduous trees, the second has a canopy of more than 70 per cent deciduous trees with a white spruce understorey, the third has mixed wood stands with 40 to 60 per cent spruce and aspen cover in the canopy, and the fourth is a stand with 70 per cent spruce canopy. A total of eight harvest and fire treatments were applied to each forest type, three times within the experimental area. Each treatment takes in a 10 hectare area, which is considered within the lower limit of a standard operational cutblock. The eight treatments were a clearcut with 2 per cent green tree retention, 10 per cent green tree retention, 20 per cent green tree retention, 50 per cent green tree retention, 75 per cent green tree retention, 100 per cent green tree retention to act as a control, a prescribed burn on unharvested stands for comparison against various tree retentions using mechanical harvesting, and 10 per cent harvest with slash burn. However, just 18 years into the full rotation, project managers are struggling to keep the experiment going due to constant funding challenges, with the exception of DMI, which has given its unwavering support for the project since its inception in 1998. Canfor has also been a consistent supporter to this point. Initially, it was industry, with support from the government, that requested that the experiment take place over a full rotation. Spence says that EMEND now finds itself at a crossroads. Without a minimum amount of annual predictable funding, and as project champions in both academia and industry retire or move on, the project’s medium to long term future as an unprecedented land base experiment is uncertain. However, he remains “guardedly optimistic” that its funding challenges can be overcome. He adds that it’s not a formidable minimum sum of predictable support that EMEND proponents need to keep it going. “We need $200,000 per year on a reliable and predictable basis to keep the lights on at EMEND and to make sure we meet the core objectives,” says Spence. EMEND is more than an experiment. It has had a major influence particularly on DMI’s forest management practices, which has helped the company keep its customers happy and earned it international attention and accolades. Jim Witiw, Biodiversity and Stewardship Program Manager at DMI, says that the company agreed to take part in the experiment initially because it believed by attaching itself to this long range, adaptive management research, it would give the project more credibility. “The signal I am getting is that DMI has among the highest levels of retention within our cutblocks of anyone in Canada,” says Witiw. It has been influenced heavily by the science at EMEND. The company has abandoned the two-pass, clearcut forest harvesting approach and has adopted an ecosystem-based forest management approach. Witiw adds that even though the monitoring of results on the EMEND site “is only at the 10 yard line”, all the evidence so far based on the company’s EBM approach is that DMI is definitely on the right track. The company targets 15 per cent retention of merchantable timber as a landscape average within its FMA, not taking into account areas it has set aside as too sensitive or wetlands. Together, DMI and Canfor have invested about $7 million of the $18 million spent on the EMEND experiment so far, some of it as important in-kind contributions. What they have contributed has been leveraged to attract investment from other companies and to attract grant money. There has been some project-specific support provided to EMEND by Manning Diversified Forest Products and Weyerhaeuser. The EMEND management board would gladly welcome more industry support. Despite its location within DMI’s FMA, Witiw says that the forest management data offered by EMEND has considerable potential applications throughout the northern boreal forest. EMEND also serves a useful academic purpose, as 15 graduate students and three post-doctorate fellows are currently working on active research projects on the site. Both Spence and Witiw say that there is no doubt that the demise of the SFMN and the reasonably reliable funding it supplied to EMEND has had an impact on predictable cash flow to support this long term research endeavor. “I would say that EMEND has been in intensive care ever since the Sustainable Forest Management Network closed in 2007,” says Spence. EMEND is proving its value on the international stage, as federal government representatives and scientists attending international events frequently point to it as one example of how Canada is supporting sustainable forest management in the ecologically important boreal forest. The Ecosystem Management Emulating Natural Disturbance project is one of the largest projects of its kind in North America, taking in 1,000 hectares within about 28 square kilometers.